It took a mid-week snowstorm to prompt me, but I finally created a Gluten Free Philly page on Facebook. Just "like" the page and join in the discussion. You can share your thoughts on area restaurants and favorite products, post topics in the forum, and more. On Tuesday, I shared word of the new Asian dumplings from Feel Good Foods. The dumplings will be making their way to area markets shortly, but can be ordered as soon as next week from the Gluten-Free Mall. In Center City, new Southwestern and tapas spot Kokopelli (1904 Chestnut Street, 215-557-7510) maintains a menu annotated with gluten-free items, ranging from soups and salads to seafood and sides. Just ask for the menu when checking in at the restaurant. Giovanni's in Quakertown (224 North West End Boulevard, 215-538-2120) offers gluten-free pizza in a 10" size. New reader John L. writes that Zinc Cafe, a New American BYOB in Medford (679 Stokes Road, 609-953-9462) is gluten-free-friendly. Maize, a New American BYO in Perkasie (519 West Walnut Street, 215-257-2264) can accommodate gluten-free dietary requests. Thanks to reader Kathy W. for the tip. Cafe Monterosso has relocated from Yardley to Fairless Hills (530 Lincoln Highway, 215-295-1311, near the Langhorne Ski Shop. The restaurant still offers gluten-free pizza, pasta and dessert. Five Guys Burgers and Fries has opened new locations in Conshohocken (200 West Ridge Pike, 610-825-5557) and in Center City Philadelphia (1109 Walnut Street, 215-238-9955). P.F. Chang's China Bistro has continued its Warrior Card program into the new year, offering holders 10 percent off their guest checks. To sign up for the card, go to the Warrior Card page of the restaurant's web site. Reader Manisha A. let me know about two Hockessin, Delaware coffee shops that have gluten-free sweets: Bishops Coffee Shop (6949 Lancaster Pike, 302-239-7579) and Over Coffee Cafe (144 Lantana Drive, 302-239-5353). To celebrate its first birthday, Sweet Freedom Bakery will be giving away mini cupcakes to the first 100 customers tomorrow, beginning at noon. Also find free samples from the bakery at Rescue Rittenhouse Spa on Saturdays throughout January. The Handcrafted Cookie Company in Phoenixville, which bakes gluten-free chocolate chip cookies, will be closing February 28. On the bakery's Facebook page, the owners cite family priorities as the reason. Reader Jackie P. wrote in to tell me that Post's Fruity and Cocoa Pebbles cereals have new packaging that trumpets their gluten free status. 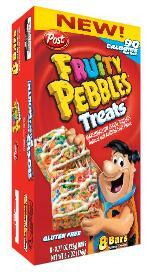 In addition, Post has introduced 90-calorie Pebbles-branded marshmallow treats that are gluten free. You're probably not thinking about eating Italian ices at this time of year, but there are Rita's locations open year-round at area malls. The company's newly available Cheesecake Cream Ice is gluten free. Kikkoman's new gluten-free soy sauce is a Tamari-style soy sauce brewed with rice instead of wheat. Take note, though, that the sodium content (960 mg per one-tablespoon serving) is high compared with reduced-sodium, gluten-free soy sauces produced by San-J, La Choy and Kari-Out. Ever imagine eating M&Ms without the candy shell? Hershey's has introduced new chocolate candies called Drops that, through the means of modern science, can help you attain that previously unachievable goal. Both the Milk Chocolate and - more significantly - the Cookies 'n' Creme flavors are gluten free. HomeFree has just re-launched its soft-baked oatmeal cookies and mini oatmeal chip cookies as gluten free, using gluten-free oats. The company says it uses care in its facility to prevent cross-contamination, tests random batches, and utilizes a certified gluten-free facility. You can use the store-finder feature on Home Free's website or order directly from the company. Adding to its seasonal varieties, gluten-free bakery Kinnikinnick Foods now has cinnamon-apple donuts. 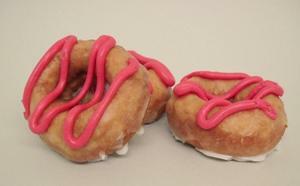 The treat is made with apple puree and cinnamon, topped with a cinnamon glaze and hot-pink cinnamon icing. The donuts are available until February 28 and can be ordered online or by phone at 1-877-503-4466. The Viking Cooking School's "Gluten-Free Gourmet" class in Bryn Mawr next Tuesday is sold out, but there's a similar course at the Atlantic City location on Thursday, March 17. The Cape May County Library will host a gluten-free cooking demonstration by chef James Harris on Saturday, January 29. Chef Harris, of Harrah's Resorts in Atlantic City, will prepare a menu consisting of gluten-free pizzas, wraps and pasta dishes. The event will begin at 1 p.m. at the main branch of the library, 30 Mechanic Street in Cape May Court House. Registration and a valid library card are required to attend. Register online or by calling 609-463-6350. Also on January 29, local vendors and natural-foods companies will be sampling gluten-free products at Weavers Way Co-op in Chestnut Hill. The National Foundation for Celiac Awareness will be there to answer questions and give out information. This event is open to the public and will run from noon to 4 p.m. Finally this week, I wanted to give thanks to Amy Ratner, the associate editor of Gluten-Free Living magazine. Her recent blog post about the maturation of her daughter, who has celiac disease, really struck a chord with me and my wife. Even if you don't have kids on a gluten-free diet, it's a good read. Just started following your blog. This post is full of great info for those in Philly and all around the country. Thanks for the kind comments on my blog about my daughter. You might be interested to know that she has worked at Rita's for the past four summers and gets a number of customers who ask her if the Italian Ice is gluten free. They are always surprised when she tells them she has celiac disease and knows about the gluten free diet. Have a great weekend. I am sure I will enjoy reading your blog regularly and will look for you on facebook, since Gluten-Free Living uses it too.